Photograph of Edward N. Calisch. No date. The names of the earliest Jewish students at the University are unknown. The Oberdorfer twins of Charlottesville, Archie (later a physician) and Leo (later an attorney), enrolled as day students in the late 1890s, commuting by trolley from their home at Fry's Springs. By the turn of the twentieth century, students from the Northeast were enrolling in significant numbers and the number of Jewish students, especially from New York, was growing. Virginia had a reputation for being less anti-Semitic than other major universities and by the late 1920s, 8.5% of the student population was Jewish. Edward N. Calisch. Galley proof of "Jefferson's Religion." 1903. 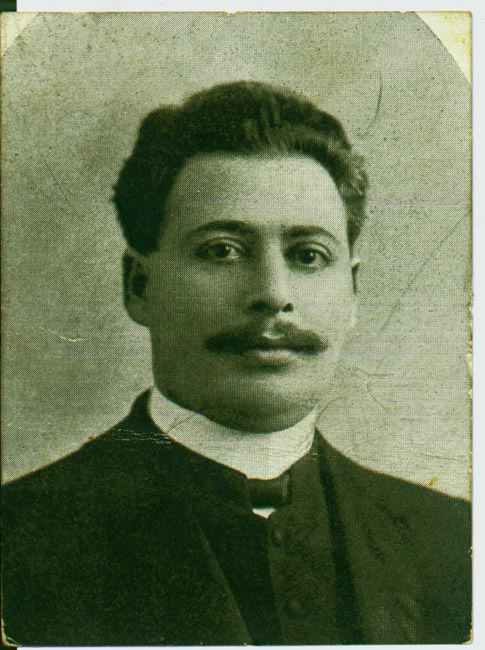 In 1901 Richmond Rabbi Edward N. Calisch enrolled at the University, commuting to Charlottesville three days a week while continuing to serve his Beth Ahabah congregation. He joined the Washington Literary Society, the debating team and was a charter member of both the Raven Society and the University's Phi Beta Kappa chapter. 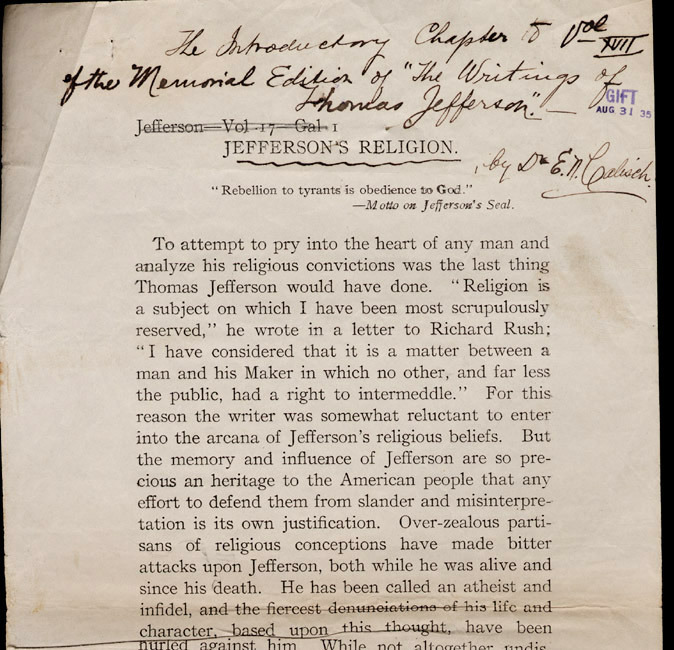 In 1903 his essay entitled "Jefferson's Religion" was published in the Memorial Edition of The Writings of Thomas Jefferson. Edward N. Calisch. 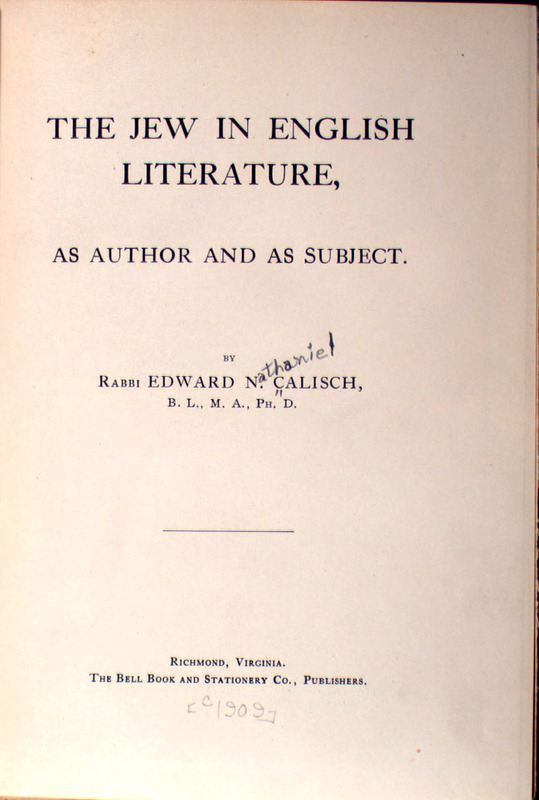 The Jew in English Literature as Author and as Subject. Richmond, Va.: Bell Book and Stationery Co.: 1909 (cover). Five years later he earned a doctoral degree for The Jew in English Literature as Author and as Subject (title page). This was followed by works on the teaching of Jewish and Biblical history. Rabbi Calisch returned to the University in 1936 to give the baccalaureate address in which he declared, "We have lost the things of the spirit. We have become a nation of materialists living in a mechanical universe. Utility has become our God and technology is his high priest."